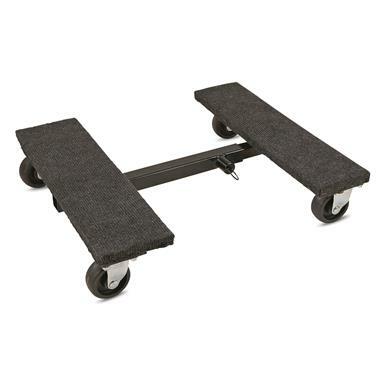 Shop Tuff Adjustable Mover's Dolly, 18" x 18"-30" x 4.5"
Adjusts to a whopping 30" wide! Moving heavy loads is no problem at all with the Shop Tuff 18" x 18"-30" Adjustable Mover's Dolly. It has a 1,200-lb. weight capacity and is adjustable from 18" wide to an expansive 30" with the spring-loaded pin. Customize it to fit your needs! The hardwood frame stands up to tough challenges, while the carpeted deck protects cargo from scratches. And you'll love the ease of use. The four 3" swivels make it a dream to move. Handles heavy loads up to 1,200 lbs. Measures: 18" x 18" - 30" x 4.5"
Tow Tuff ATV Weight Distributing Dolly, 800 lb. Tow Tuff ATV Weight Distributing Adjustable Trailer Dolly, 1,200 lb. Ball adjusts from 18.7" to 24.6"
2" trailer ball adjusts from 16" to 25"
Give your ATV a needed hand.